I subscribe and so want this for hubby! Hey guys! I’m in! Could really use the Bluetooth in my mom-mobile! I want in - thanks for the giveaway! I’d like to enter the giveaway - could really use the roadster in my little car. I’m already a newsletter subscriber and a Facebook fan. I’d love to have one of these to go with my Droid X! Please enter me to win the Roadster. 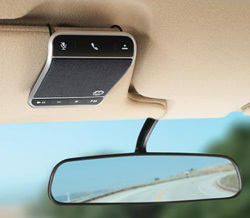 This would be such a safer and more convenient way to communicate in the car. Yes, please enter me in this giveaway. I’m already a subscriber. Please enter me in the drawing. would like to have the motorola roadster. Please enter me. Email Subscriber, thanks for the chance! Let me know when you need my shipping address! This looks like a fun & safe device… I’d love it! Please sign me up for the giveaway! Already subscribed, and hoping for good news. This would be a lifesaver, if I won the Roadster! I want to enter!I follow you and have for some time now. Hi, I’m already a fan on FB, thank you. enter me, would really like this one. I WOULD LIKE TO WIN THIS!! Sign me up, I am feeling lucky, thx..
Looks Awesome!! I subscribe by email. My husband would love to have this. I want to enter to win. Do I get any extra credit if I really love techlicious? I like Techlicious on Facebook, too. Please enter me—thanks for the chance. I subscribed, Count ME in!! I would love to win. Love your sites! Thank you for the chance to win!